Right now I’m on a Metro North train heading the NYC. I’ve been invited to sit on an advisory council at the UN on building a sustainable energy future. I’ll let you know how the meeting goes, after I take a few selfies to immortalize the experience in case I’m not invited back. Why might I not? Because I can either be a good boy, hold my tongue, and get to serve on more committees (maybe); or I can speak the truth as I see it. It’s not a hard decision: I’ll be going with the latter. I really don’t know how to do differently any more; it’s a matter of internal integrity. Now, I may not understand the ‘truth’ any better than the next person. But I do have access to a lot of data that seems to confirm this one idea: Humanity is not going to painlessly wean itself off of fossil fuels. Instead, we’ll hit some sort of a wall: be it a food/population crisis, a climate crisis, or a debt/fiscal/economic crisis. Each of those candidates has it roots in our global society’s addition to fossil fuels. No growth in fossil fuels and we get no growth in our debt-based economy. Translation: we’ll have a debt/financial crisis. No fossil fuels and our entire method of industrial agriculture breaks down. Food crisis anyone? Now, we won’t suddenly run out of fossil fuels. But we are going to find it increasingly difficult to extract more and more of them. And other limits like oceanic acidification and climate change may force us to move away from fossil fuels for a totally different set of reasons. No matter the path we take, we need to transition sooner or later. We should know that. One of the things I did in the book version of The Crash Course was to run the basic numbers to make the case that, unless we immediate decide to pursue the equivalent of a Manhattan Project (times) an Apollo Project (times) some whole number like 10, we’re not going to make anything even remotely resembling a seamless transition to alternative energy. LONDON, 27 March, 2016 – The world is increasingly investing in renewable energy. Last year, according to UN figures, global investment in solar power, wind turbines and other renewable forms of energy was $266 billion. But right now, the report says, renewable energy sources deliver just 10.3% of global electrical power. Neither the report’s authors nor anyone else thinks that is enough to slow climate change driven by rising global temperatures as a consequence of greenhouse gas emissions from fossil fuels. In the last century, this has already climbed by 1°C. In Paris in December 2015, 195 nations agreed on a global plan to limit global warming to a figure no more than 2°C above the long-term average for most of human history. In 2015, the world installed the equivalent of 13,000 five-megawatt wind turbines. But to contain global warming to a figure less than 2°C nations would have to ramp up renewable investment by 2028 to the annual equivalent of 485,000 such wind turbines. “That’s a 37-fold increase in the annual installation rate in only 13 years just to achieve the wind power goal,” Professor Jones said. There’s some really important information in this study, not the least of which is the realization that, to achieve just the wind power goal, the world would have to increase its rate of wind tower installation by 3,700% (or 37 fold). This translates into going from installing 36 towers per day (the current rate) to 1,329 per day. Every day. 365 days a year. For 13 years straight. With no breaks. 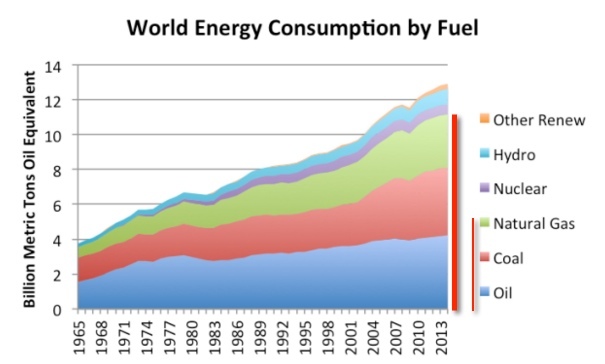 But our fossil fuel addiction goes well beyond the desire/need for electricity. Transportation fuels are just as essential to our current human condition. He and a colleague argue in the journal Energy Policy that during each hour of every day 3.7 million barrels of oil are pumped from wells; 932,000 tons of coal are dug; 395 million cubic metres of natural gas are piped from the ground; and 4.1 million tons of CO2 is released into the atmosphere. In that same hour, another 9,300 people are added to the global population. By 2100, the world will be home to 11 billion of us. “So the question becomes, how will they be fed and housed and what will be their energy source? Currently 1.2 billion people in the world do not have access to electricity, and there are plans to try to get them on the grid. The numbers you start dealing with become so large that they are difficult to comprehend,” Professor Jones says. 3.7 million barrels of oil per hour, along with nearly a million tons of coal and 400 million cubic meters of gas. Every day, for 365 days a year. The numbers are indeed difficult to comprehend. But they just don’t measure up to our hopes for the future. At the current pace of energy transition, we’re not only going to miss the climate targets we’ve set, but we’re also going to miss the chance gracefully deal with the continued growth in both our debt pile and population. While people excitedly point out the growth rates in energy renewables, they often fail to note either/both the scale involved and/or the fact that a tiny percentage growth in fossil fuels will utterly dwarf a large percentage gain in renewables. This is the dynamic that the numbers in the above study are warning us of. Loudly. It’s nothing personal. It’s just math. But it’s going to get very personal over the next years and decades as the world is finally forced to confront the idiocy of attempting infinite growth on a (quite) finite planet. And it’s for this reason I am going to have a hard time being a good little committee member and sign off on some cheery report suggesting we can achieve a sustainable energy future if we all just try a little harder. We’re going to need to try harder than any generation has ever had to try on anything, ever in all of history, to remake our energy infrastructure. These days it’s very hard to scan the headlines without running into seriously troubling ecological data. CANBERRA, Australia—An underwater heat wave is devastating huge swaths of Australia’s Great Barrier Reef, marine researchers have found. An aerial survey of the chain of 3,000 coral outcrops—a Unesco world-heritage site and the only living system visible from space—found 95% of its northern area, roughly half the reef’s length, had been hit by a bleaching event that began six months ago. Damage to the southern area is still being assessed. This bleaching is caused by the loss of the symbiotic algae upon which coral depends, causing the coral organisms to die from starvation. Research reveals that phytoplankton stocks in the region fell an alarming 30 percent over just the last 16 years. This most recent tally of the collapse of this vital ocean pasture ecosystem compounds the observed collapse that has been documented since the early 1950’s! The collapse of ocean pasture ecosystems is taking place in all of the world’s ocean, not just in the Indian Ocean. Indeed many of those ocean basins are in a much worse condition of pasture collapse than the Indian Ocean. We find that these trends in chlorophyll are driven by enhanced ocean stratification due to rapid warming in the Indian Ocean, which suppresses nutrient mixing from subsurface layers. Future climate projections suggest that the Indian Ocean will continue to warm, driving this productive region into an ecological desert. These are by no means rare exceptions plucked from a sea of otherwise positive news. The world’s ecosystems are having a really rough time absorbing the scope and the pace of changes that humans are creating. The grief expressed above by the scientists who study these ecosystems tells the tale. The world is just not yet serious enough about the urgency of transitioning away from fossil fuels. The math says that without a tremendous change in behavior, far greater than anything currently on display, we simply won’t “get there” waiting for market forces to do the job for us. We’ll have to make and adhere to very different priorities. Such as completely redirecting our entire defense budgets to the process of retooling our entire relationship to energy. We’ll need our buildings to use less energy. And we’ll need to live closer to where we work and play. Our food will have to be grown differently. And it will have to travel less far to get to our plate. Electricity will have to come from sources other than fossil fuels too. Is it possible to figure this out in time? Well, whether it is or not is sort of beside the point because these changes are going to be forced on us anyways if we don’t get our act together in time. So I guess I could be an optimist on the UN panel by telling them that I have 99% confidence that humans will someday be powering 100% of their energy needs from the sun. I’ll just leave out that what I mean is that, in 100 or 200 years, humans will have painfully reverted back to a 1600’s-style subsistence farming lifestyle. The point of this article is to refocus our attention on the need for each of us to lead the way, to begin our own individual energy transitions without waiting for some top-down solutions to come forward. The calvary simply isn’t going to show up. In our podcasts with Joel Salatin, Singing Frogs farm and Toby Hemenway, we’ve been surfacing examples of the ways in which we can begin farming regeneratively and relationally today. You can do this on your own if you garden. Or you can support local farmers/CSAs that will do this for you. Anybody paying into a pension or trying to manage an endowment that needs to be there in 30 or 40 years (or forever, as is the case for university endowments) needs to understand that projections based on prior rates of economic growth are fantasies, hatched when we had the luxury of pretending there were no energy limits. The restructuring of our energy economy, if taken under our own terms and on our own timelines, will utterly crush traditional economic growth as we’ve come to know and love it. If taken under more dire terms, there may not even be a recognizable economy for a very long time. These are serious matters. They deserve serious consideration and even more serious answers. Every little step each of us can make, both for its direct impact and for its leadership effects, is actually vitally important. So one question we might ask ourselves is: How can I use less energy today, enjoy life just as much (if not more), and be part of the solution? The future is going to be very different from the past. And the only thing that could come along to ameliorate the situation from an energy-food-survival standpoint would be a brand new source of energy. Something along the lines of workable, scalable fusion or if LENR (Low-Energy Nuclear Reaction) pans out and is quickly adopted. As long as we are collectively relying on ~80% of our primary energy coming from fossil fuels, we’re on the opposite path from creating a world worth inheriting. And the extent to which we fail to run he numbers and appreciate the scale and the scope and the timing involved, preferring perhaps to content ourselves with just the renewables side of the story, is the extent to which we are failing to appreciate the challenges we face. So my challenge for myself is to see how much I can further cut back my own energy use — something I’ve already done in good measure by heating my water using the sun, insulating my home, and having a relatively efficient vehicle. But there’s still a lot more I can do.